PUPS ARE HERE ! Go to the puppy page for more information and details. We are a small German Shepherd kennel in Eastern North Carolina near Jacksonville and have been breeding German Shepherd dogs for over thirty years. We produce three to four litters of puppies a year. We only breed dog's that have had their hip's x-rayed and certified by the OFA, or the German SV or Schutzhund USA "A-Stamp" program. We only breed dogs from European and Czech working bloodlines. It is our belief that dogs bred from solid German Shepherd working bloodlines have solid nerves and temperament. These are qualities that most folks want in a dog for there family. A pup with good nerves and temperament is less likely to be sharp and aggressive to your friends and their children. 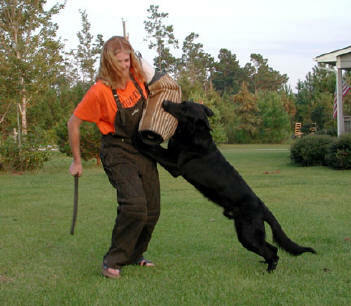 Our dogs go thru Schutzhund training. All of our pups are covered by a written guarantee on the puppy's hip's and health. Your puppy will be tattooed in the right ear and have all vaccinations up to date when you pick it up. On occasions we have adult dogs for sale. German Shepherd puppies for sale and dogs for Schutzhund training, Police service, narcotics, bomb detection, therapy work, Search and Rescue. 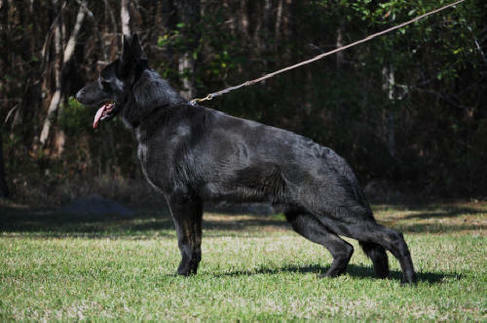 We have been German Shepherd breeders for over thirty years. Our dogs have proven themselves to do serious sport and service work from coast to coast. Dogs bred from good strong German Shepherd working bloodlines prove to be more self assured, have good even temperament and make wonderful family companion and guard dogs. I often have solid black German Shepherd pups from our breedings. We offer German Shepherd stud service to approved females. We often have solid black German Shepherd pups for sale. Our puppies are all registered with the AKC. As a breeder for over thirty years we solidly stand behind our guarantee and feel that we offer the best quality German Shepherd puppy for the price that you will find. Will give any assistance and advice on bringing up your pup. Our daughter Sgt. Jessica Leigh Baysden, Animal Care Specialist U.S. Army Dec. 15, 1980 - Nov. 26, 2008 and our first stud dog imported from Germany Sirk vom Schwarzen Milan SchH III KKL1 Oct. 14, 1997 - Jan. 28, 2006.